The teaser has landed! Project Glocal: Stamped features nekko found all across Asia. Curator Dayang Yraola is all grins. Riding the jeepney like a boss. Here's a little behind the scenes look at Project Glocal. After the tour of Intramuros, Team Transi(en)t needed to go to Escolta to preapre for the Artist's Talk by Urich Lau and Shih Tung Lo at 98B. How to cross over from Manila's south back to the North? The jeepney to the rescue. Out the old walled city and past the Post Office at Plaza Lawton, over Jones Bridge and a right turn to Escolta. Voila! We're delivered almost right in front of the First United Building. Quite an authentic Manila experience, too. 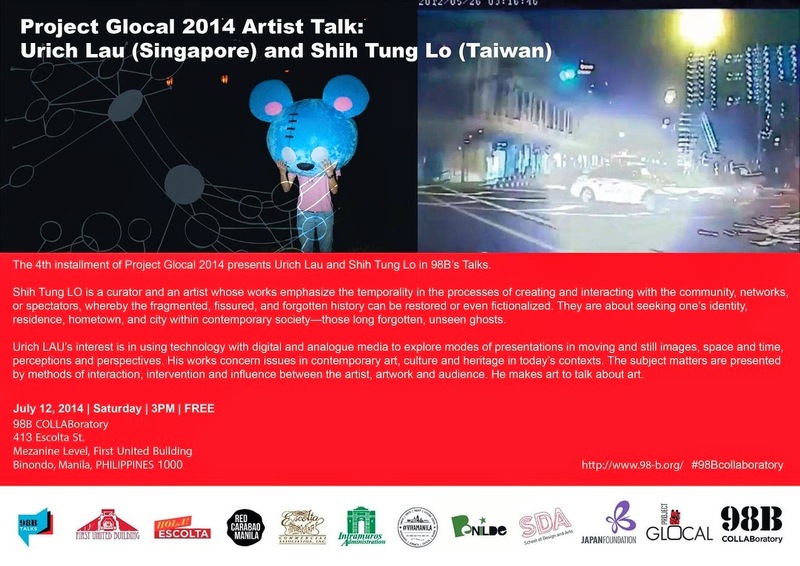 Everyone is invited to the fourth installment of Project Glocal 2014 which features artist's talks by Urich Lau and Shih Tung Lo on Saturday, 12 July 2014 at 98B COLLABoratory. Shih Tung Lo is a Taiwanese curator and artist whose works emphasize the temporality in the processes of creating and interacting with the community, networks or spectators. He is interested in exploring the fissures and piecing together the fragments--and even fictionalizing--forgotten history. His works are about seeking one's identity, residence, hometown and city within contemporary society--places which are inhabited by long forgotten and unseen ghosts. Singaporean Urich Lau's interest lies in using technology with analogue and digital media to explore modes of presentations in moving and still images, space and time, perceptions and perspectives. His works concern issues in contemporary art, culture and heritage in today's contexts. The subject matters are presented through methods of interaction, intervention and influence between the artist, artwork and audience. He makes art to talk about art. Talks will be held at 3PM, 98B COLLABoratory in the First United Building, 413 Escolta Street, Binondo, Manila. Admission is free. Web platform manager Jessel Duque explains the documentation tasks for interns. This year, Project Glocal Manila's interns are students from the School of Design and Arts's Art Management program at the De La Salle-College of St. Benilde. The internship gives the students the chance to observe how an ongoing international art project is run. More than that, the students are also expected to participate in any of these three core areas: liaison and artists' assistantship, marketing and web content. 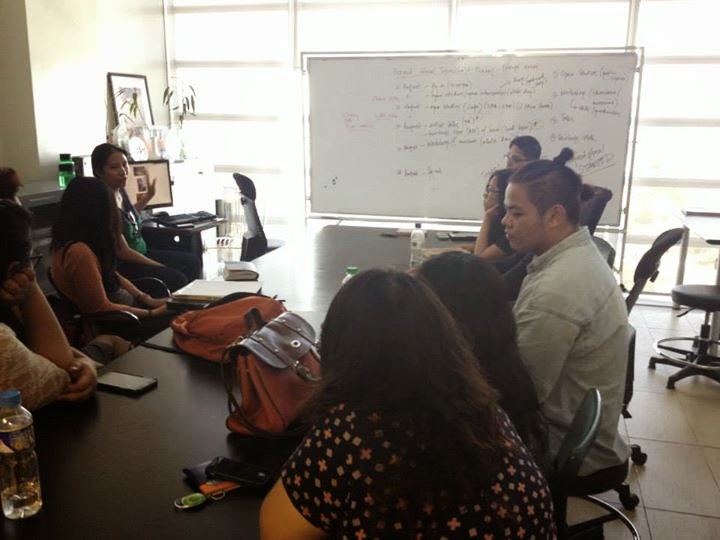 Students doing liaison and AA work are assigned to helping specific artists while they complete their residencies in Manila. Interns' tasks include coordinating the artists' activities and help out with the research in preparation for their work for Transi(en)t Manila. Those assigned with marketing will work closely with Mark Laccay from Artiste Connect, to help out in coordinating with the various institutions and sponsors for Project Glocal. The documentation team is tasked with covering the activities that will later be turned into content for Project Glocal's various web and online platforms. The interns will also go visit other Project Glocal Transi(en)t sites, most notably, in Penang, Malaysia in August. They will participate in workshops, immersions and studio visits with local artists. Thus, the internship becomes invaluable as it places the students not just on the sidelines, but also right in the middle of the action. The internship is made possible through the coordination of Jason Vitorillo from CSB's School of Design Arts Management program, Mark Laccay from Artiste Connect, Team Transi(en)t web platform manager Jessel Duque, and Project Glocal curator Dayang Yraola.